Most of us are not strangers to the idea of keeping employee numbers low. Many organisations have budget / employee number freezes – yet in many of them, the work that needs to be done just can’t happen with those people officially listed on the payroll. An interesting Harvard Management ‘tip for the day’ published in November 2015 (Nov 19. 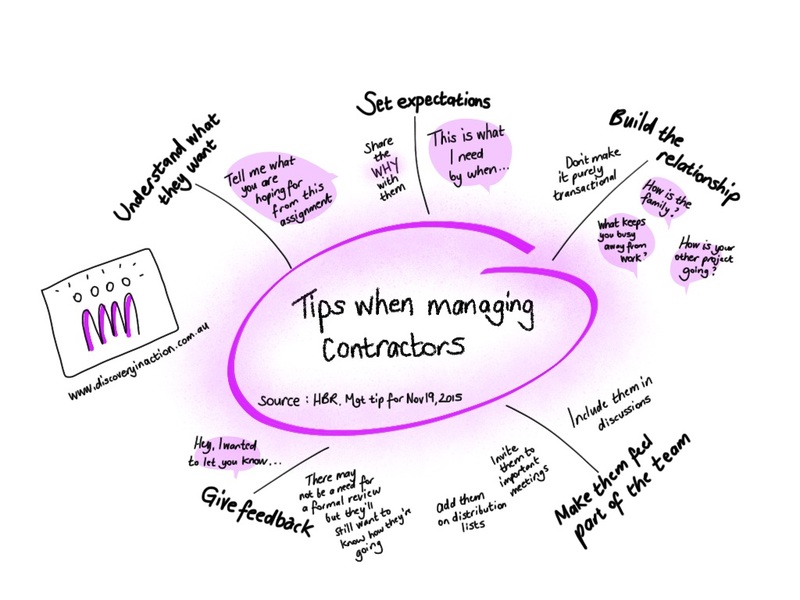 2015) offered some excellent ideas for those leaders and managers who have contractors in their team. Managers want to do right by their people, but the expectations are different when you’re managing contractors. How do you motivate and engage people who aren’t full employees? Understand what they want. Ask your contractors why they’re interested in working for your company. Knowing what they’re hoping for in the assignment will help you understand them. Set expectations. Be clear about what you want from them, including deadlines for their deliverables. Build the relationship. Talk to them about their family, their interests, and other projects they’re working on. Make them feel part of the team. Invite them to important meetings, bring them into water-cooler conversations, and add them to the team email list. Give feedback. There’s no need to do a formal review, but telling them what you think of their work will improve performance and your working relationship. Click here to see the full HBR post by Amy Gallo – 7 tips for managing freelancers and independent contractors.